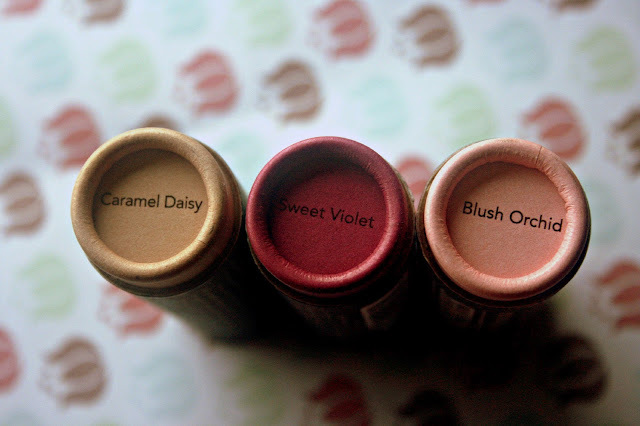 Makeup, Beauty and More: Burt's Bees Tinted Lip Balms - New Shades for Spring! Burt's Bees Tinted Lip Balms - New Shades for Spring! Burt's Bees Tinted Lip Balms ($6.99) are some of my absolute favorite lip balms for dry, chapped lips. Burt's has introduced four new shades for spring to the already existing line of five shades. I have three of four shades here and all of them are sheer, glossy and super moisturizing. Sweet Violet is the most pigmented of them all and looks like a very light, plum on my lips. If you have pigmented lips, Sweet Violet is a nice, everyday shade for a soft wash of color. Caramel Daisy and Blush Orchid on the other hand are a tad more sheer, but just as moisturizing. The packaging is quite nice and the lip balm itself is tiny and easy to tuck into your purse. The texture is a tad waxy going on bare lips, but settles down well in a few minutes. The color fades off after about 2 hours and there's enough moisture left behind to keep lips conditioned for hours together. These balms have a slick, slightly glossy finish, so be sure to blot off any excess while using them under lipsticks. There's a slight, fruity smell that dissipates quickly. As someone with extremely dry lips in winter, I absolutely love these and can't recommend them enough! Burt's Bees Tinted Lip Balms are 100% Natural and the packaging is made from reusable and recyclable paper tube with approximately 60% Postconsumer recycled content. Available at all at select natural, grocery, drug, and mass retailers, and via www.burtsbees.com. What are your thoughts on the Burt's Bees Tinted Lip Balms? Oh you'll love these then!